In 2007, space probe Dawn was launched. And now, nine years later the probe has reached its final destination; Ceres. It has already discovered some strange, exciting things. Is it salt or water? When Dawn started orbiting Ceres in 2015, it found strange, white spots on the dwarf-planet’s surface. Unfortunately, Ceres’ cameras couldn’t take pictures that were detailed enough for us to see what those white spots were. The NASA scientists that control the space probe then managed to get Dawn into a lower orbit around dwarf-planet Ceres. In this lower orbit, Dawn can observe the white spots more closely. Scientists discovered that the white spots are all the bottoms of craters. This made them think that the spots are either made of salt or ice. The space probe couldn't get close enough to the dwarf-planet to find out which one it is. If the white spots are ice, this means that the dwarf-planet has at least one requirement for life; water. However it’s unlikely that we’ll find aliens there, since the big rock is way too cold. And on top of that, the dwarf-planet doesn’t have an atmosphere. 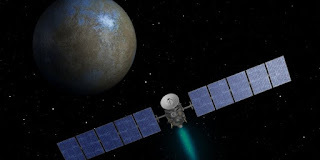 But Ceres isn’t the only dwarf planet space probe Dawn visited. Space probe Dawn already orbited another dwarf planet called Vesta between in 2011 and 2012. This makes Dawn the only space probe that has orbited a celestial body, studied it and travelled further to orbit and study a second celestial object. The two Voyager space probes also studied multiple celestial bodies; the gas giants of our solar system, but they never orbited them. On Vesta there were dark spots that sparked the interest of scientists. Fortunately, Dawn could zoom in enough onto those dark spots to tell what they are; craters. Craters may not sound as interesting as water and possible - though highly unlikely - alien life. Those craters can tells us something else though; we can discover a lot about what happened during Vesta’s life, and what it was like in our solar system billions of years ago. Dwarf-planets are a bit like time-capsules in this way. If we want to learn more about the history of our solar system, the main thing we have to do is study asteroids better. This is also the reason that space probe Rosetta and comet lander Philae were launched. 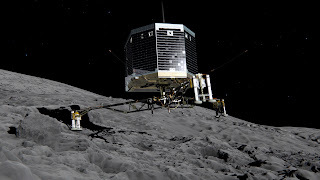 Those probes closely studied comet 67P/Churyumov-Gerasimenko, and even discovered the building blocks of life there. Space probe Dawn, however, isn’t going to orbit another asteroid. NASA scientists had proposed plans about sending Dawn to another asteroid, but this was cancelled. The scientists leading Dawn’s mission think that staying in orbit around Vesta can give us way more scientific data than a quick visit to another asteroid. So it was decided that Dawn will stay in Vesta’s orbit forever, and gather data until at least 2017.